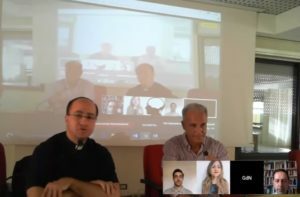 The 2016/17 closing meeting of the Interdisciplinary Research Group in Neurobioethics (GdN), chaired by Coordinator F. Alberto Carrara, LC, took place in the afternoon of June 23, with the active participation of various members and collaborators. The occasion was conclusive, but at the same time opened to the 2017/18 research and training program scheduling, which will focus on the theme “From head transplantation to personal identity, from human rights to eschatology. A year of considerations on Trans-Humanism last frontiers”. 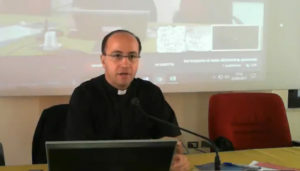 The seminar, held at the Ateneo Pontificio Regina Apostolorum in collaboration with the “Science and Faith Institute” and the “UNESCO Chair in Bioethics and Human Rights”, has proposed, through a detailed and participatory study, the general lines of the research and study path which it intends to pursue for the next academic year 2017-2018; a year when one of the most exciting and emerging topics in neurosciences and bioethics studies, trans-humanism, will figure as protagonist. We are talking specifically about the issue of the “long-waited” head transplantation, which will be attempted for the first time in December 2017, and about the persistent problem of personal identity, related to the phases before and after the event. As clearly explained in the seminar’s introduction, and then repeated during the interventions, the subject will find space for analysis and discussion under different perspectives: from neurosurgery to neurosciences; from psychiatric and psychological contributions to philosophical, theological approaches and, then, achieving Law, adopting particular emphasis on the Informed Consent in condition of vulnerability, and about the value of physicality along with the awareness of body’s importance in relation to the person. The first human head transplantation (or, as highlighted by Professor A. Carrara, “most of the body transplantation”) has to be considered a decisive step towards trans-humanist aspirations, reason why the news not only remains under the national media spotlights, but also it’s pointed out by active and influential contemporary movements devoted to trans-humanism, as well as it certainly represents a milestone for scientific research. The Italian neurosurgeon, Dr. Sergio Canavero, will lead the team that will collaborate with him on the “Human Head Transplantation” procedure, which currently seems it will be performed in China at Harbin Medical University, on a healthy body volunteer whose identity is still uncertain (initially it had to be a Russian quadriplegic, then replaced by a Chinese man, condemned to capital punishment, to overcome compatibility issues). During the meeting, the GdN, coherently with its interdisciplinary character, saw the presentation of several expert voices, each of which, as spokesperson of a different type of contribution, suggested questions or topics useful to the research project for the year 2017-2018, thus already sketching a 360-degree coverage for the entire route; this will take its final shape during the second module of the APRA Faculty of Bioethics / Science and Faith Summer Course, scheduled for July 2018 and focused on “Enhancement and Emerging Technologies”, but it will be preceded by a “mature fruit”, namely the Brain Awareness Week promoted by the DANA Foundation. Seminars and roundtable discussions will be carried out around this topic: from neurosurgical, bioethical, legal, psychological, anthropological, philosophical and psychiatric aspects to health and social issues, until the consequences that follow the so-called “head transplantation” and its scientific-cultural backgrounds, ensuring so the possibility to arrive, through the gradualness and orderliness proper of an academic and multidisciplinary study pathway, at the point where significant and solid conceptual instruments are nimbly avalaible in order to face the open discussion about identity and subject’s approach towards its own body (which is semantically extended more than its physicality). UNESCO Chair in Bioethics and Human Rights contribution to the research program has been revealed in advance by the Director of the Chair, Professor Alberto Garcia: the contribution will be focused on the delicate and specific issue of Informed Consent, primarily raised for what concerns the relationship between the transplantation perspective and the position of the subjects considered to be most vulnerable, such as quadriplegic patients or who is affected by pathologies which weaken the motor system; this is valid also for the people whose political-social and cultural context does not allow, directly or indirectly, the full exercise of the rights established by the Universal Declaration of Human Rights. The principles invoked focus on the effective awareness of an eventual consent, adopting a deep attitude of prudence and caution on evaluating as consciously free the decision to undergo to specific interventions in a personal situation soaked and driven by suffering, or characterized by a sometimes desperate past (topic also touched by Professor Cotroneo together with the hypnotherapy role on patients close to the transplantation therapeutic option, starting from the already feasible operations -hand, arm, etc…- whose discomforts are equally attested and present in literature). 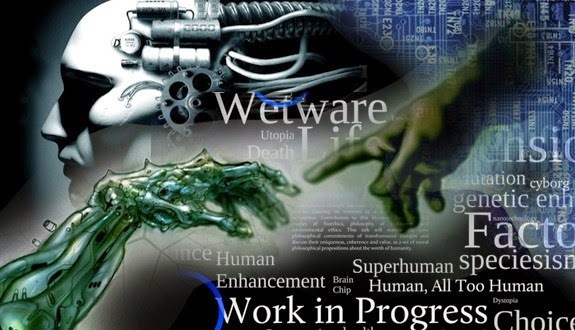 Then if we add to this the temporal hypothesis, namely future side effects and perspectives reasonably expected from the quality of life’s point of view, the impasse quickly emerges on several fronts. I-CONSENT (Improving guidelines for Informed Consent, including vulnerable populations, under a gender perspective) is the European project of considerable reach, provided by Horizon 2020, the European Union Research and Innovation Framework Program, won by the consortium in which participates the UNESCO Chair in Bioethics and Human Rights, which will take care over three years to investigate the bays of Informed Consent, with particular regard to vulnerable populations. It is a project in which the collaboration between the different partners aims to improve the reference guidelines in the theoretical and practical treatment of the theme extended to both sexes, beyond age limits and pre-emptively compared to the rise of cultural or religious barriers in the concrete of specific situations, which lead to the practice of consensus. A special focus will be applied on the issue of vaccinations (crux and difficulties, related especially to children/teenagers, women, even more specifically pregnant women, will be handled rigorously and systematically) and of ethical issues regarding the IC in medicine, particularly in the scientific research; a desired perspective of a result that not only can ensure close proximity between citizens and healthcare, rather a collaborative relationship and a rational, in all respects, informed interconnection. 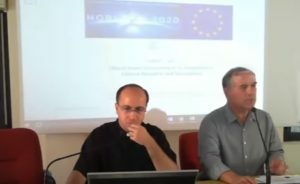 The group of UNESCO-led researchers working on the project will discuss ethical, legal, scientific tools to be provided to the community to fill some of the current situations of “emptiness”/difficulties at managing consensus in comparison with cultural and religious pluralism, from which we have the duty to protect and respect liberty and, in this case, the self-determination of the subjects involved, first of all those who trust the doctor, the specialist and the research. Clearly, at this last meeting of GdN, the interesting collaboration with i-CONSENT will consist on constantly bring attention to the freedom of patients suffering from invasive pathologies, which lead to an existential past of suffering and that sometimes affects the decision of the subject to undergo certain interventions or treatments, as might happen in the case of head transplantation. Here so the Program will adopt as horizon not exclusively the legal term of patient’s avalaibility to informed consent and the legal validity of research, but it will overcome ethics and deontology while remaining complied to one of the major social problems currently facing the healthcare sector: the balance between trust and distrust; possible or illusory hope; legality or wrongfulness, mutually interconnected and not rarely stumbling. Next year we will then see many disciplines and authoritative personalities work together, united by the common interest towards man and his benefit within neuroscience innovation.